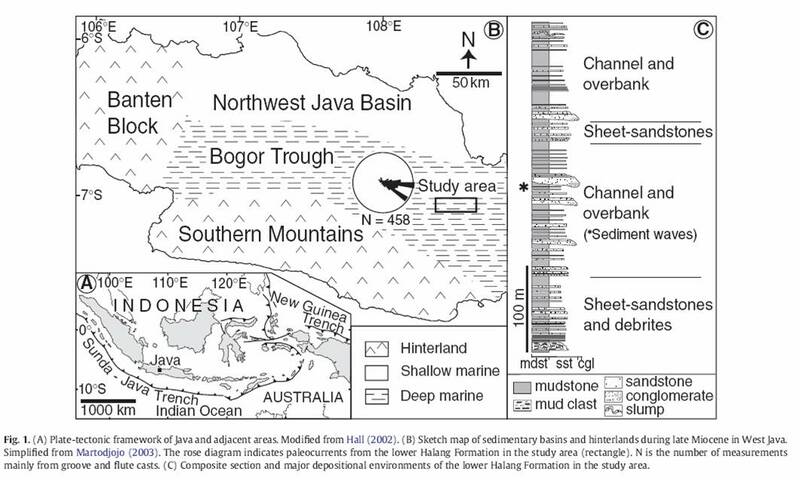 This article is about the first discovery of outcrop-scale, fine-grained sediment waves in the left-side muddy overbank deposits relative to the down-current direction of the adjacent channel deposits in the lower Halang Formation turbidite system in a late Miocene back-arc basin, West Java. The present outcrop-scale examples can fill the gap in dimension and formative processes between laboratory-scale bedforms and modern large-scale, fine-grained sediment waves for elucidating scale-independent processes, which are responsible for the development of fine-grained waveforms in a deep-water environment. This article has been published in Sedimentary Geology. Tagged backarc basin, Bogor Trough, deepwater, halang formation, high-sinuosity channel, Java, Late Miocene, ma'ruf mukti, outcrop, sediment-wave, tectonics of indonesia, turbidites, volcanic arc, volcaniclastics, west java.